Accountant Kieran Morrow is adding up the benefits of purchasing a brand-new property at an exciting new location in Wiltshire. He is delighted with the service he has received at every step on the home-buying journey from the Bovis Homes sales and site teams at the Tadpole Cross location, near Swindon. He is now enjoying the new property – a four-bedroom Salisbury house type – and everything the location has to offer with his partner Tania, an events co-ordinator, and his eight-year-old daughter Ellie. “Tania and I are over the moon with the standard of our new home and everything that goes with it,” explained Kieran. “We are both massively impressed with the service that we have received since day one, when we first walked into the sales office, and continue to be so. “We were sold on Bovis Homes very soon after we met members of the sales team, who were very knowledgeable about the location, honest and professional. “All the way through, our questions about the house and sales process were answered quickly and very helpfully and nothing was ever too much trouble. “The attention to detail and checking process has been very impressive - everyone has gone above and beyond. 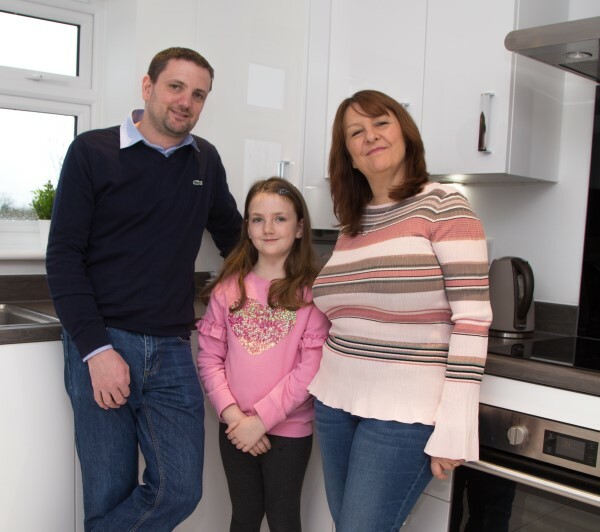 Kieran and Tania's new semi-detached home features an array of integrated appliances that come included with the purchase price of a Bovis Home. The family are also taking advantage of the spacious open-plan sitting and dining area, which features French doors to the garden, and enjoying the superb views of the countryside nearby. “One of the deciding factors in buying the house was being so near to the fields to go walking and play with Ellie – it is a lovely location and environment for her to grow up in,” said Kieran.